March 2015 • SMT Magazine 69 Todd kramer is Ceo of Secure Components llC, an AS6081 & AS9120 certified indepen- dent distributor of electronic and mechanical components to the aerospace, defense, and high-reliability industries, and chairman, uSnC/ieCQ. To contact kramer or to read past columns, click here. 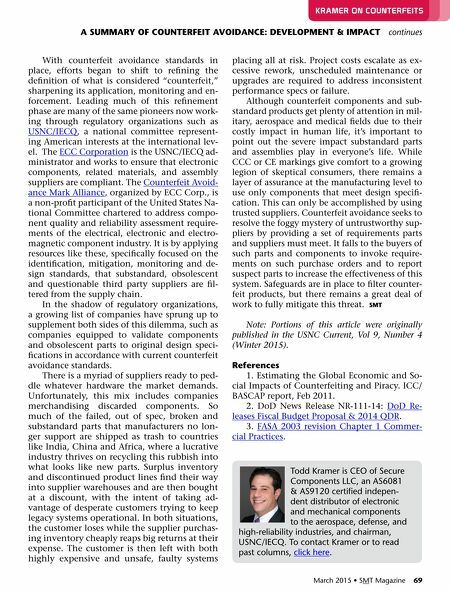 a SUmmarY OF cOUnTErFEIT avOIDancE: DEvELOPmEnT & ImPacT continues kraMer on CounterFeIts With counterfeit avoidance standards in place, efforts began to shift to refining the definition of what is considered "counterfeit," sharpening its application, monitoring and en- forcement. Leading much of this refinement phase are many of the same pioneers now work- ing through regulatory organizations such as USNC/IECQ, a national committee represent- ing American interests at the international lev- el. The ECC Corporation is the USNC/IECQ ad- ministrator and works to ensure that electronic components, related materials, and assembly suppliers are compliant. The Counterfeit Avoid- ance Mark Alliance, organized by ECC Corp., is a non-profit participant of the United States Na- tional Committee chartered to address compo- nent quality and reliability assessment require- ments of the electrical, electronic and electro- magnetic component industry. 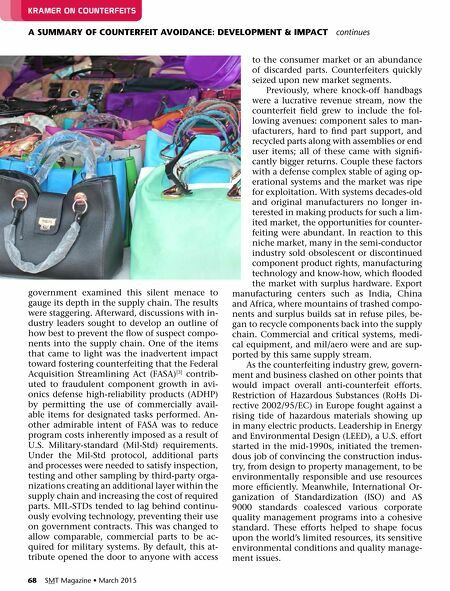 It is by applying resources like these, specifically focused on the identification, mitigation, monitoring and de- sign standards, that substandard, obsolescent and questionable third party suppliers are fil- tered from the supply chain. In the shadow of regulatory organizations, a growing list of companies have sprung up to supplement both sides of this dilemma, such as companies equipped to validate components and obsolescent parts to original design speci- fications in accordance with current counterfeit avoidance standards. There is a myriad of suppliers ready to ped- dle whatever hardware the market demands. Unfortunately, this mix includes companies merchandising discarded components. So much of the failed, out of spec, broken and substandard parts that manufacturers no lon- ger support are shipped as trash to countries like India, China and Africa, where a lucrative industry thrives on recycling this rubbish into what looks like new parts. Surplus inventory and discontinued product lines find their way into supplier warehouses and are then bought at a discount, with the intent of taking ad - vantage of desperate customers trying to keep legacy systems operational. In both situations, the customer loses while the supplier purchas- ing inventory cheaply reaps big returns at their expense. The customer is then left with both highly expensive and unsafe, faulty systems placing all at risk. Project costs escalate as ex- cessive rework, unscheduled maintenance or upgrades are required to address inconsistent performance specs or failure. Although counterfeit components and sub- standard products get plenty of attention in mil- itary, aerospace and medical fields due to their costly impact in human life, it's important to point out the severe impact substandard parts and assemblies play in everyone's life. While CCC or CE markings give comfort to a growing legion of skeptical consumers, there remains a layer of assurance at the manufacturing level to use only components that meet design specifi - cation. This can only be accomplished by using trusted suppliers. Counterfeit avoidance seeks to resolve the foggy mystery of untrustworthy sup- pliers by providing a set of requirements parts and suppliers must meet. It falls to the buyers of such parts and components to invoke require- ments on such purchase orders and to report suspect parts to increase the effectiveness of this system. Safeguards are in place to filter counter- feit products, but there remains a great deal of work to fully mitigate this threat. SmT Note: Portions of this article were originally published in the USNC Current, Vol 9, Number 4 (Winter 2015). references 1. Estimating the Global Economic and So- cial Impacts of Counterfeiting and Piracy. ICC/ BASCAP report, Feb 2011. 2. DoD News Release NR-111-14: DoD Re- leases Fiscal Budget Proposal & 2014 QDR. 3. FASA 2003 revision Chapter 1 Commer- cial Practices.